Love them or loathe them, free-to-play mobile games are here to stay. You need only look at the royal fortune Candy Crush has made the King company in its short lifetime to see why. People are spending money on this franchise – some of them quite a lot – but King knows it can't sit still: last year it launched sister title Candy Crush Soda Saga to stem dwindling profits from its flagship title. More significantly, King agreed a deal that will see it acquired by gaming behemoth Activision Blizzard for a cool $5.9 billion. But before the final papers are signed King is rolling out its next game, Candy Crush Jelly Saga, which adds a couple of new twists to the otherwise familiar colour-swiping formula. The most notable new addition is boss battles, in which the player goes head-to-head with an AI adversary. 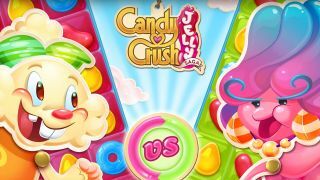 "They will play on the same board as you, so you have to change your thinking as you have another computer player interacting with the game board," Candy Crush Senior Vice President Tjodolf Sommestad tells us. "You have to plan further ahead." There's also a new type of level where the player spreads jelly across the board of candy pieces, but the boss battles are more interesting in that they hint at what might be down the line: multiplayer. Could we one day see those AI bosses replaced with other humans? "This is something we have considered and are thinking about exploring," says Sommestad. "We are interested in doing more, but we think this is the first step." It's not the only thing that alludes to the future. Jelly Saga is a game for King to "tell the story around the Candy Kingdom and bring more life to the Candy Crush universe," Sommestad explains. The more King develops the world and characters of Candy Crush, the more potential it has to expand the franchise. Sommestad also tells us that the original Candy Crush and Candy Crush Soda Saga will continue to be supported and updated alongside Jelly Saga. Last year talk show host Stephen Colbert and Liam Neeson entertained us with a parody sketch for a Candy Crush movie, but given Activision Blizzard's plan to open its own film and television studio, it may soon be more than a laughing matter. And then there's toys, TV, theme park rides… Just ask Rovio, whose ubiquitous Angry Birds franchise has branched out into all these things and more. KIng will also offer more immediate opportunities within the games, suggests Sommestad. "Maybe you want to customise the character you're playing as," he says, hinting at another potential way to get players to spend money. "We could do something that's interesting there." Of course, there's also potential to move onto other platforms. The charm of Candy Crush's swiping mechanic might be lost if the franchise ever found its way onto PS4/Xbox One, but there are other platforms where it might make more sense. "We haven't been a fast mover, but we're testing things," Sommestad tells us, "We're experimenting with watches internally. We want something that can add strongly to the gameplay experience. We're looking into it – it might happen in the future if products like wearables have traction." When Activision Blizzard completes its acquisition deal with King (it should be finalised in Q2 of this year), the Candy Crush maker is going to be in a good place. Not only will it have huge financial backing, it will have the support of a corporation known for owning two of the longest-running video game franchises of all time: Call of Duty and World of Warcraft. Activision Blizzard knows how to keep games alive. "The candy crush franchise is quite young, we're launching our third title now with Jelly," says Sommestad. "[Activision] have decades of experience in building strong franchises, and I think they can share some of those experiences with us." The wisdom will pass both ways. Beyond digital trading card game Hearthstone, Activision Blizzard has been slow to the mobile gaming revolution, especially compared to rival EA; with King under its wing it has an opportunity to change that. Tjodolf Sommestad believes King has a lot it can teach its new owner. "I think they appreciate the fact we are strong on mobile, which is the future platform," he says.